Lily's Ink Pad: Sale-a-bration Starter! Sale-a-bration starts tomorrow, January 22 with Stampin' Up! How cool is that? 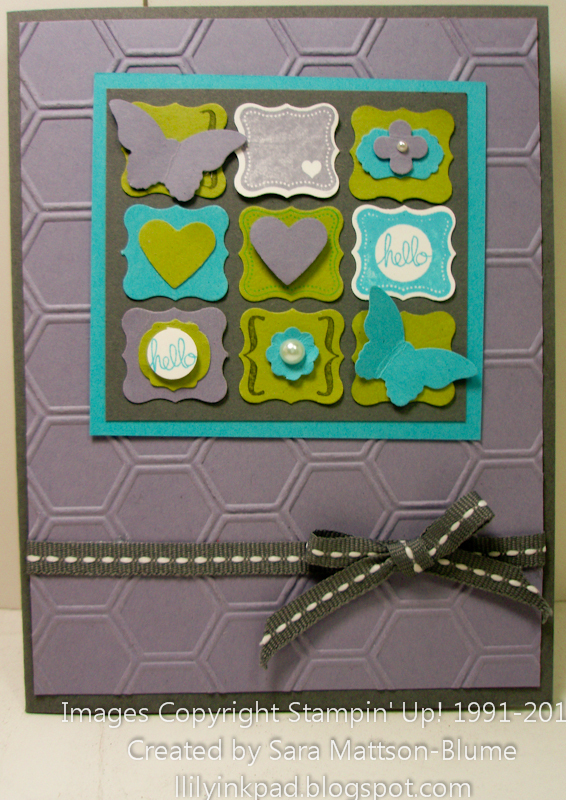 I post on odd days, so I am posting my favorite cards so far I made with Sale-a-bration products. If you are a Facebook Fan, you've seen a photo of the process of making this card into a swap. Multiples were a bit tricky, but fun, too. 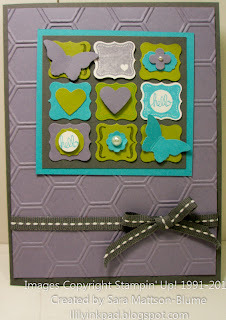 I used TWO Sale-a-bration products on this card--the Pretty Petites Stamp Set and the coordinating Petite Curly Label Punch. I thought of all of the cute frame projects I've seen and decided to minaturize it. I added layers of Stampin' Up! punches. They go together so well, that I found the design easy. Punching enough parts for 15 cards, well, a bit too much.